The Real Ghostbusters has been largely forgotten, which is kind of a shame. The series started in 1986 and serves as something of a missing link between the comical, kid-friendly cartoons of the 80's and the more adult story-driven adventure shows of the 90's. This certainly isn't Batman: The Animated Series, but it's not Scooby-Doo, either. There were some creepy villains and monsters in this show, along with some cool concepts. The story editor was J. Michael Straczynski, who also wrote a vast number of episodes, including this one. "X-Mas Marks the Spot" was the last episode of the first season. It's set on Christmas Eve, or more accurately on two Christmas Eves. After bungling a job in upstate New York, the Ghostbusters wander through a time portal and find themselves in Victorian London. Not realizing what they're doing, they help Ebeneezer Scrooge with a haunting and wind up capturing the three Christmas ghosts. Still unaware where they are, the stumble back through the portal and return home, where they load the ghosts into the containment unit. Soon, they discover Christmas has been ruined, largely thanks to a classic ghost story written by Scrooge detailing how he defeated three spirits who tried to haunt him. 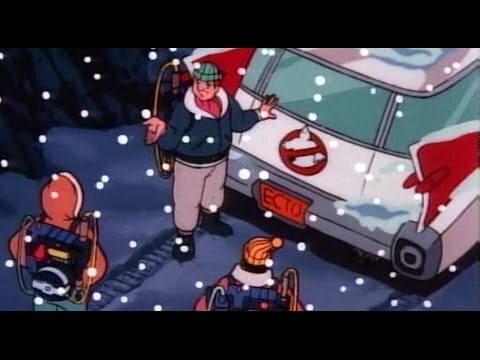 Egon goes into the containment unit to recover the spirits, while the others return to Scrooge's time and try to fill in for the missing ghosts. There's a lot to pick apart here if you're feeling critical: the explanations are underdeveloped, the rationale pays lip service to teaching Venkman to appreciate Christmas, and the whole thing feels a little rushed. That being said, the sheer audacity of the premise, coupled with some solid jokes, makes for a great twist on the classic. This is hardly the only holiday special where special effects and tricks are used to fake a haunting, but this featured some great twists to the formula. Venkman pushes Scrooge around in a rolling chair while making him wear a View-Master, while Scrooge recites classic lines about his school and upbringing - tell me that isn't great. This one's less a horror story than a science-fiction piece, but given the rather complex relationship between A Christmas Carol and time travel, that's appropriate. This offers some subtle nods to It's a Wonderful Life, as well, in its use of an alternate timeline (which is itself playing off of Scrooge, but I'm getting off track). It's far from a perfect episode - there are certainly much darker installments of this series that do a better job representing its significance to animation - but it's still a fun, intelligent piece.